Happy February, the month of amour! But actually screw Valentine’s Day, I’m not into it. But the above is my desktop background because it seemed apropos. One of my favorite little joys is hunting down graphic images that tile well. Images with some kind of repetitive pattern or that would look good if repeated. Graphic designs, illustrations, wallpaper prints, and fabric are all great sources. 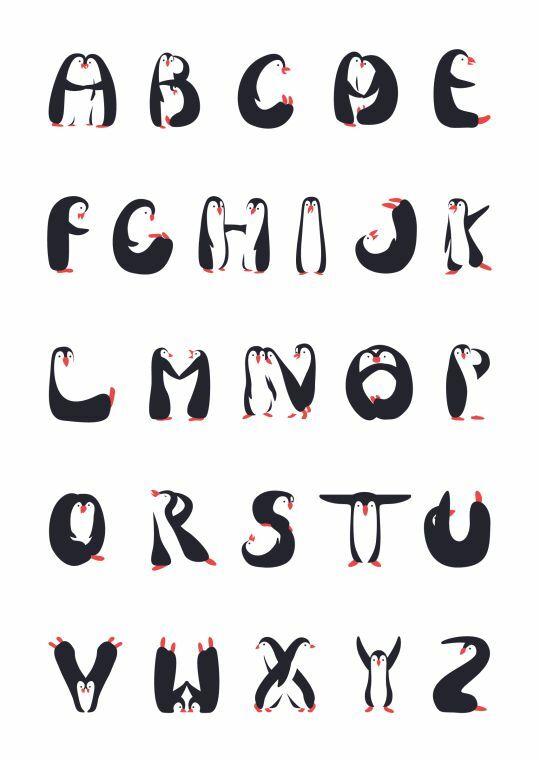 Last month I used an illustration of cartoon penguins spelling out the alphabet. My favorite was the super-diva-ish letter R.
Did any of you go to any of the Woman’s Marches spread around the US- or France, or Antarctica? Apparently it was the biggest protest in the US history, and I’m pretty inspired. It just shows what we can do when we come together. Not that the march achieved any concrete gains for women, POC, LGBTQ, or trans people, but I’m feeling a lot less alone. There is a resistance. President Trump *shudder* has only been president very briefly, but I’m reminded of it by the increasing number of small dystopian things happening- like Canadians being turned away from the US border so that they couldn’t participate in yesterday’s march and the disappearance of references to LGBTQ folks, climate change, and civil rights from the White House website. The lead up to Christmas is always my favorite part of the whole holiday. The anticipation, scents, and sounds make me so happy that I can almost forget the winter world is a cruel and barren wasteland. And then it ends and, not being a fan of New Year’s, I feel quite adrift. All there is to look ahead to is my eventual return to university and that is not a rosy prospect. It’s not that I’m bored or lack for things to do. But I feel wistful and a bit depressed. There aren’t so many bright colors or maniacally forced happiness and I honestly miss it. It’s taken me a while to regain the desire to blog (or do anything, for that matter) post-election. I haven’t made the fact that I’m fairly liberal a secret, on this blog or anywhere else. And I’m very distressed about the looming prospect of a Trump presidency. However, this is something I’ve talked about on various other social media, and for now I don’t see this blog becoming a platform for that. In very great part because it’s not something I’m ready to talk about to a general audience. I’ve been thinking a lot about how to broach the subject of the election here. This is all there will be for now. And in the meantime, I’d like to let you in on some family dynamics. Some family reading dynamics. We’re all rather literate. I read more than either of my parents do. I also think about and talk about books a great deal more. There are over 400 distinct titles on my ‘to read’ list at the moment, and at one point it was over 2000. I love recommending books to people (especially when people are willing to talk about their other favorites so I can get a good idea of what they like)- this may sound a bit strange, but I’ve realized that searching for ‘the perfect thing’ is one of my favorite things to do. I do it with movies, books, gifts, names, everything really. In a horrible twist of fate, I don’t like taking recommendations very much. Especially when it comes to books. Books take a little while longer to get through than movies, and while I will not infrequently add things to my reading list based on recommendations, I’m not likely to let some upstart recommendation jump the 400+ line of books waiting for my love and attention. And you have to read a book when you’re in the right mood for it. I can’t just be in the right mood for a book because someone recommended it. But to the point of this post: My parents and I trade recommendations pretty frequently. Or they sometimes recommend things that I eventually get around to and the rest of the time I’m shoving an elite selection of books at them, desperately trying to get them to read when really they have lives and other hobbies and I… well, I do, but not as much.